Man Who Suffocated An Attacking Mountain Lion Describes Fight For His Life Travis Kauffman, 31, was halfway through his run in the foothills outside Fort Collins, Colo., when he heard rustling behind him. He soon found himself in a struggle to survive. 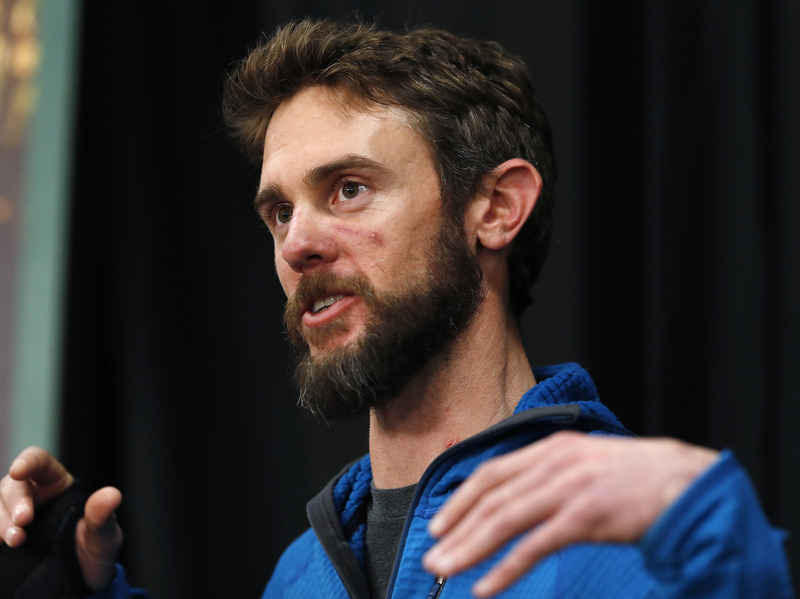 Travis Kauffman responds to questions during a news conference Thursday about his encounter with a mountain lion while running a trail just west of Fort Collins, Colo., this month. Kauffman's incredible story made the rounds earlier this month, when media around the world reported of an anonymous runner who had killed a juvenile mountain lion in self-defense. Few details were announced at the time, and reporters had to rely on a statement from Colorado Parks and Wildlife. On Thursday, Kauffman's identity was announced to the world in a news conference. It was an unseasonably warm day as Kauffman, about 5-foot-10 and 155 pounds, threw on shorts and a fleece and headed to the foothills around Fort Collins for a trail run on the afternoon of Feb. 4. He decided not to listen to music on his run — a decision he says might have saved his life because it allowed him to hear his surroundings. Halfway through the run, he stopped to take in the view from the top of a ridge. As he descended on a narrow wooden section of trail, he told KUNC, "I just kind of heard some pine needles rustling behind me." Sometimes he doesn't turn around, because it's usually just a deer or a squirrel. This time, Kauffman did turn — and saw a mountain lion about 10 feet away. He said he felt the reality of the situation in his gut. "One of my worst fears was confirmed," he said. Kauffman put up his arms and screamed to try to intimidate the lion — as wildlife experts suggest — but the lion lunged. "Its jaws locked onto my hand and wrist, and pretty much stayed there the whole time," Kauffman told KUNC. The big cat wrapped itself around the man's body, and dug its front claws into his back. Kauffman, who has been a cat dad for the past six months, knew how dangerous a cat's back legs can be. Kauffman said he felt a wave of fear, worried the young cat's mother might be nearby and might join in the fight. But it was just the two of them. Locked in a struggle for life or death, they tumbled together 20 feet off the trail into a gully. The lion was now on its back, but its teeth were still firmly clamped onto the man's wrist, and it was still scratching at him with its claws. Kauffman used one leg to pin the animal's hindquarters to the ground. He then tried subduing the creature with sticks, he said, but they were rotten and did no damage. So he grabbed a rock and started smashing it onto the cat's head, stunning the creature. That's when Kauffman says he screamed a "barbarian yell" and went in for the kill. "I got my right foot onto its neck, and then I was able to get some weight onto its windpipe, and that's what eventually suffocated it." All told, he said, the battle lasted about 10 minutes. Only when the cat was dead did it finally release its grip on Kauffman's wrist. Once he killed the animal, he ran on, blood dripping from his face and wrist, feeling as though he were being watched by lions the whole time. He eventually found a runner and two hikers, who gave him water and drove him to the emergency room, where he got more than two dozen stitches. According to CPW, the juvenile lion weighed between 35 and 40 pounds. The necropsy confirmed that it had been killed by suffocation. CPW said Kauffman was the 22nd person attacked by a mountain lion in Colorado since 1990. Kauffman told reporters he had been hesitant to tell his story, believing he wouldn't be able to live up to his own "Chuck Norris"-like reputation. "The story is bigger than my puny form," he said. Kauffman said he feels great and plans to start running again soon — this time, with a friend. Just in case.